Ottoville’s Quinley Schlagbaum, left, goes to the floor with Minster’s Jessica Falk for a loose ballduring a nonconference game on Monday in Ottoville. Ottoville’s Kasey Knippen shoots with pressure from Minster’s Demaris Wolf during a nonconference game on Monday in Ottoville. Ottoville’s Quinley Schlagbaum shoots with pressure from Minster’s Danielle Barhorst during a nonconference game on Monday in Ottoville. 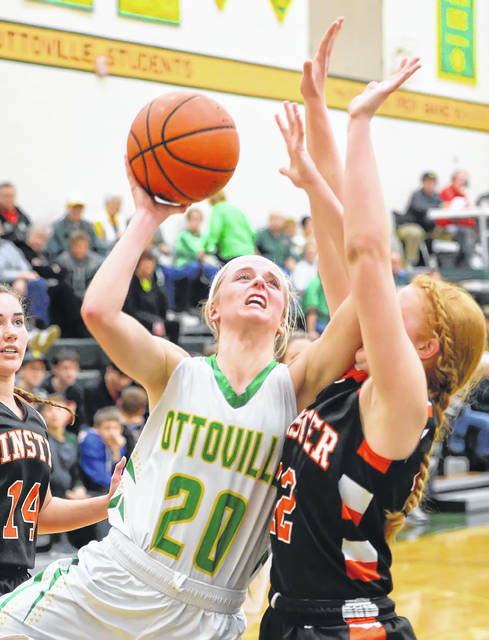 OTTOVILLE – Ottoville discovered the same thing several other good high school girls basketball teams have learned recently when it was beaten 46-28 by Minster on Monday night. Good isn’t good enough to beat the Wildcats. It takes very good. Minster (18-1) won by 30 points over Putnam County League leader Kalida earlier this season. It beat Versailles, the No. 2 team in the Midwest Athletic Conference, by 22 points last week and also has a 22-point win over Anna, the No. 2 team in the Shelby County Athletic League. 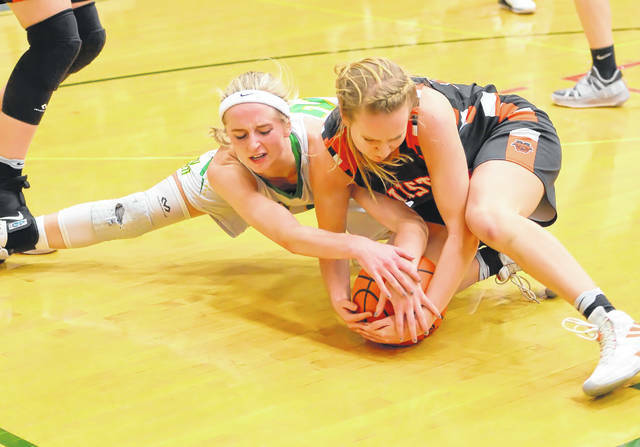 Monday night’s game – which was a rematch of last year’s Division IV state championship game – turned Minster’s way early and Ottoville was unable to turn it in a different direction. Jessica Falk led the Wildcats with 13 points, all of them in the first half. Ivy Wolf scored 11 points and Courtney Prenger, a 6-2 post player who has signed with Xavier, had 8 points and 11 rebounds. Kasey Knippen led Ottoville with 18 points on a night when the Big Green shot 27 percent (8 of 30) on field goals. Minster led 30-20 at halftime, then put the game out of reach when Ottoville went scoreless for all of the third quarter and the first minute of the fourth quarter. By the time those nine minutes were over, Minster was up by 21 points, 41-20. Defensively, Ottoville went all out to stop Prenger. But Falk shot them out of that strategy by hitting her first five shots, three of them 3-pointers, all of them in the game’s first 12 1/2 minutes. “Jessica Falk was huge in the first half,” Minster coach Mike Wiss said. Kleman said surrounding Prenger and seeing if Minster’s outside players could knock down shots was a gamble that had to be taken. “We were trying to take Prenger away because the last two times we played she ate us alive,” he said. Minster’s interior defense and size presented a formidable obstacle for Ottoville when it tried to take the ball inside. 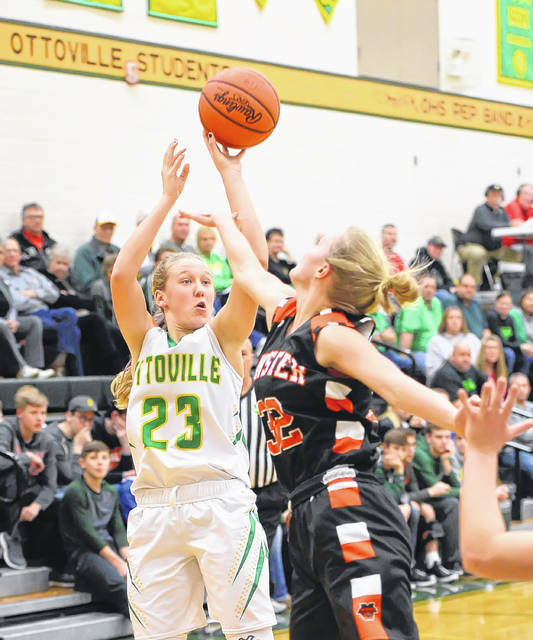 Ottoville and Minster have played each other during the regular season for many years, but this was the first time they had matched up since the Wildcats’ 64-46 win in last year’s Division IV championship game.